Who’s Your Pick For Cardinals BAMF In June? June was still an up-and-down month for the St. Louis Cardinals. Just when it seemed like things were getting back on track, such as winning a series against the White Sox, they lost back-to-back series to the Royals and Tigers. Of course, then the Cards swept the Royals and won the series to the Marlins, so the rollercoaster continued. The team finished the month with a 13-14 record and in third place, 3 1/2 games behind the Reds. 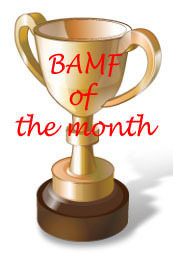 What player’s contribution to that month is most deserving of receiving our BAMF award? In April and May, the selections of Lance Lynn and Carlos Beltran were unanimous by Miranda, Tara and me. Not so for June. The month’s two candidates are obvious: Matt Holliday and Carlos Beltran. But when it came to deciding, the vote was 2-1 for Matt Holliday — Tara and I thought he earned it with his June. Miranda preferred Carlos. You can weigh in too, by voting in the poll below. For the month, Matt Holliday hit .363/.444/.538 with 10 doubles, two home runs and 14 RBI. He upped his average from .277 to .307 during the month. His best game — and the one that really got him going — was against the Royals on June 16, that crazy triple-play-that-wasn’t contest in which Mike Matheny was ejected. Matty had a single, two doubles, a homer and five RBI in that game and has continued to hit well ever since. Carlos Beltran hit .337/.400/.545 in June with six doubles, five homers and 19 RBI. He currently leads the NL in RBI with 61 (three better than Carlos Gonzalez of the Rockies) and is second in homers with 20 total (Ryan Braun has 22). His best game of the month was June 22 in Kansas City, his first game at Kauffman Stadium since the Royals traded him in 2004. He hit two two-run doubles that night plus scored two runs in the Cards 11-4 victory. He also achieve two milestones in June. On the 15th, he became the first major league switch hitter with 300 home runs and 300 stolen bases. Then, on Friday night, he got career hit No. 2,000. And, though it was on July 1, he also was voted as a starting outfielder for the All-Star Game. So, we’ve made our choices. Now it’s your turn. Also, since you’re in the voting mood, remember to vote for David Freese in the All-Star Final Vote. The online ballot is here or you can simply text N2 to 89269. Voting is open through Thursday.